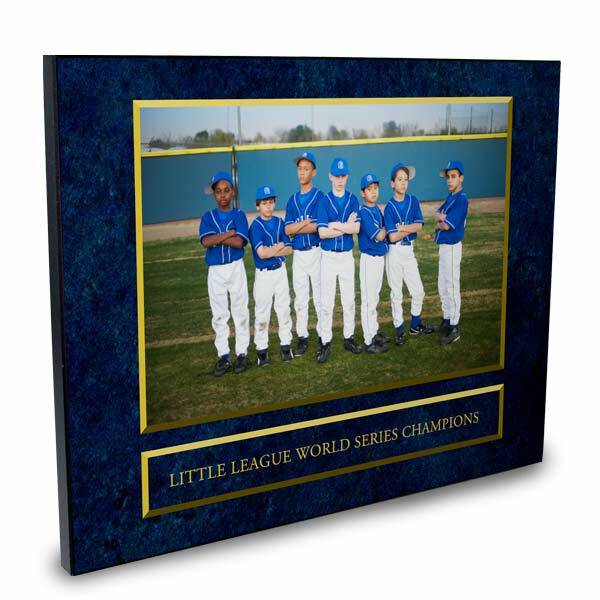 With a stunning photo and a little customized text, you can design a personalized award plaque that commemorates anything from a sports victory to a valued employee's anniversary. Create an award that celebrates a meaningful achievement and makes the recipient proud of their well deserved recognition. Using our convenient project builder, you can select from a variety of templates and photo layouts to give your plaque a unique and personalized look, no matter the occasion. Check out our custom photo plaques for more photo panel ideas. You can also personalize them with photos and text and they make a great addition to any shelf at home or your desk at work! First, find the ultimate photo that is perfect for the personalized award you are designing. Begin simply by uploading a photo into your Mailpix account and then selecting your favorite template that is tailored to your award's theme. After choosing your layout, you can create a custom photo award with these simple steps using our convenient project builder. After finding the perfect photo for the custom award, upload your picture to your Mailpix photo folder. You can even upload a prized Instagram or Facebook picture using our built-in social media account connection. Next, choose your preferred orientation, either portrait or landscape for the perfect fit for any photo. Then, select your favorite template to display your photo. After your template appears in the project builder, simply drag and drop your photo from your photo folder onto the layout and type your own text. Once you have completed your project, place it in the cart and confirm your shipping information and finally, place your order. Once your customized award plaque arrives, you will fall in love with its professional and high-quality look. Present it to a loved one or coworker so they can proudly display it by their desk at work or on a prominent wall at home. They will love how their new custom plaque showcases their special achievement or accomplishment for all to see. If you are looking for more school or office products, check out our complete school and office gift collection. No matter the occasion, you can create a fun and unique custom award plaque that showcases any accomplishment or achievement worthy of celebration. Using your own photos and custom text will allow you to create an award tailored to any friend, coworker or relative that is deserving of some well deserved recognition. With its high-quality construction and personalized look, it will be a keepsake that will be admired year after year. Our customized photo plaque awards make the ultimate gift for anyone at the workplace. Perhaps someone in the office is celebrating their 10th anniversary with the company. 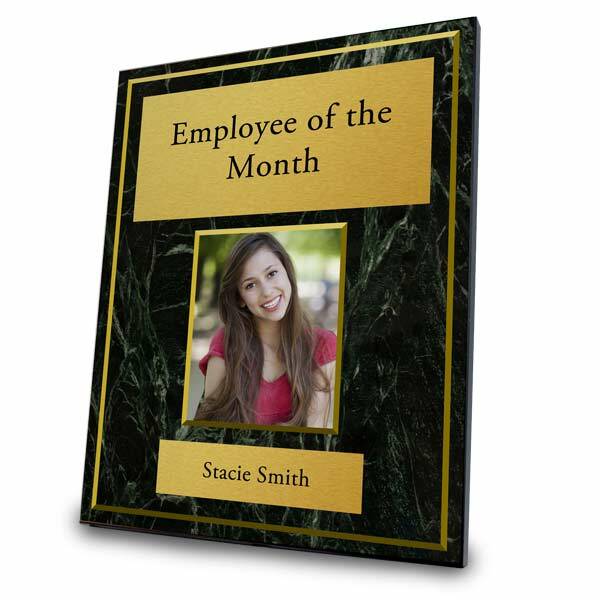 Show your appreciation for your coworker by creating a custom plaque with their photo. Add text that details their most important achievements and select one of our many background templates that appeals to their sense of style. They will be flattered by your thoughtful recognition of their accomplishments and will love displaying it by their desk at work. With a wide variety of customizable options to choose from, you are sure to create a plaque that matches their distinctive personality. Our customized photo awards are also perfect for sporting achievements. Maybe your kids play for a local little league or their school's soccer team. There is no better way to reward their accomplishments than by creating a stylish award plaque that they are sure to adore. Add a photo of your kids in their sports uniform and include text that declares their most memorable achievements. Create one for your kids at the end of the sport season or as a unique gift on their birthday or during the holidays. Whether it's an award for a special accomplishment or simply to show your appreciation, our customized award plaque are sure to fit the bill. Our background templates are available in different colors and the text can be customized with different colors and fonts to fit the occasion. Whether it's a birthday present or a holiday gift, you can create an award plaque that is perfect for any gift giving occasion. Choose your favorite template to commemorate any achievement or simply express your love in a unique way for a gift that simply can't be beat. For even more ideas, check out our photo gifts page which includes everything from home decor to toys, clothes and accessories. Maybe you are looking for a fun gift for Mom on her birthday this year. Create a stunning "Best Mom Ever" plaque. Use her best photo and your own text to show just how much you appreciate her and all she has done. Mom will be so grateful at your unique expression of appreciation and will love displaying it prominently in her kitchen or living room for all to see. Instead of a store bought gift, create a gift for her that is uniquely personal that she will cherish year after year. For even more customized photo items, check out our personalized birthday gift ideas, perfect for friends and family alike. Perhaps, you are considering a fun gift for a friend as a gesture of gratitude. Design an award plaque just for them and watch their smile light up the room when they open your thoughtful gift. Add your own text to show how thankful you are for being a great friend and never leaving your side. Choose a favorite photo to make your custom award all the more special and a background theme that compliments their style and personality. No matter the occasion, our customized photo plaques make the ultimate gift for anyone on your shopping list. Use our project builder to customize one for a loved one, friend or even a coworker at the office and show your appreciation simply for being themselves or an unparalleled achievement. With our easy to use project builder, you can build your own custom award plaque for any occasion. Begin by simply uploading your favorite photos into your Mailpix account and use them for your award plaque layout. Our project editor will allow you to choose from several elegant background layouts to fit perfectly with your award's theme. After adding a favorite photo, you can enter your own text to make the award personalized and tailored to any occasion. Once you receive the award in the mail, present to a friend, family member or coworker and see their face light up in appreciation. Our stunning, high quality award plaques will compliment any home or office decor and will be enjoyed year after year. There are so many reasons to create one for someone special. Maybe they received an exciting job promotion at work or they have an anniversary that is deserving of recognition and celebration. Our customizable options will let you create a photo award plaque that is perfect for that special someone, no matter the occasion.